A new report published by Nielsen offers a lot of insight into smartphone usage in the US. Some of the findings are particularly interesting because of how users trends are separated by age group. For example, the majority of 18 to 24 and 25 to 34 year olds now own smartphones: 53% and 64% respectively. We’ll cover the rest of the findings one by one. 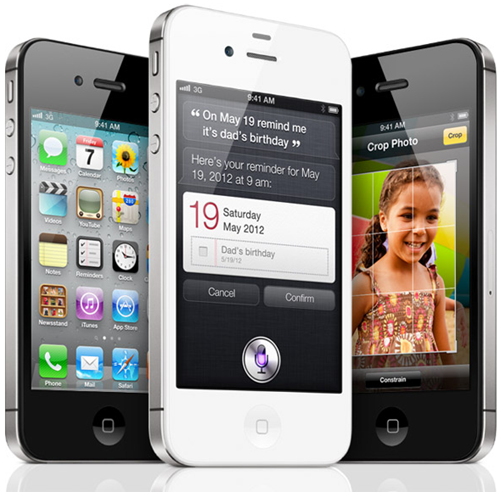 According to Nielsen research, Apple leads as the top smartphone manufacturer in the U.S. with 28.6 percent share. We’re just talking about unique devices here, not operating systems. 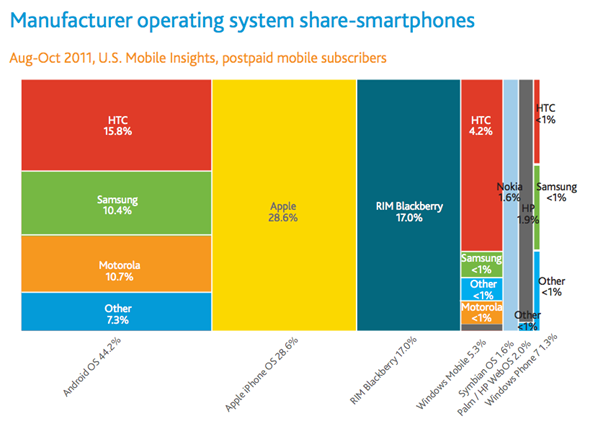 The Android powered HTC ranks third with 15.8 percent, followed by Samsung at 10.4 percent. Motorola only holds 10.7 percent of the smartphone market, but that may very well change soon since the Google acquisition. No surprise here; although Apple is the top smartphone manufacturer Android leads with the most popular OS in every age group, holding an average of 43 percent market share. Apple iOS lands in second place with averaging a market share percentage in the high twenties. BlackBerry ranks third, managing to hold on to the lower double digits. Nielsen Analytics compared websites visited with Apple and Android devices. Google was ranked first on both OS platforms with 92 percent each. Facebook, Twitter and Yahoo were the runner-ups on Apple’s iOS while Facebook, Yahoo and Wikipedia followed Google on Android. Interestingly, Twitter is missing from the entire top ten list on Android devices. Possibly, Twitter being integrated with the new iOS 5 allowed it to be highly ranked. Who has downloaded an app in the last 30 days? Android leads the bunch once again. Just about half of all Android users have downloaded an app within the last 30 days on their devices compared to 34% of Apple users. 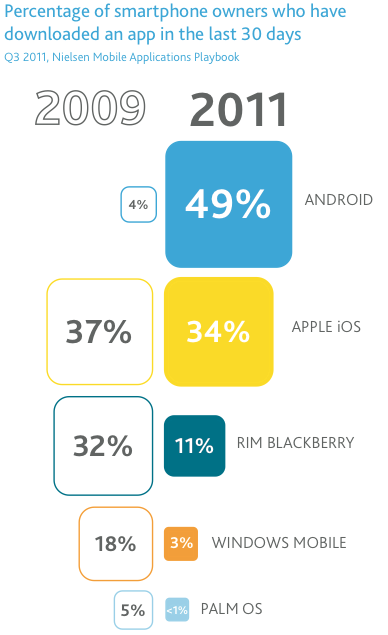 RIM customers rank third, showing only 11% of users have downloaded a single app on their Blackberry. Games rank as the top category for apps downloaded in the past thirty days. 26.3 million mobile consumers have viewed videos on their mobile devices. 87 percent of app downloaders have used deal-of-the-day websites such as Groupon or Living Social. Reports such as the one Nielsen published are useful in many ways, especially to the manufacturers. It allows them to see what consumers prefer and how they can improve their products and operating systems.